Recaptives, or Liberated Africans, were slaves freed by the British Royal Navy, which intercepted illegal slaving ships leaving Africa after the 1808 Act of Parliament ended the British slave trade. Although the slave trade had officially ended, the enterprise was so profitable that many individuals and companies carried it on illegally. Moreover the trade continued legally in North America, South Republics of America, and in the French, Spanish and Portuguese colonies. This meant that British traders could still find plenty of markets for their human cargo. Britain also felt compelled to intercept the slave ships of other nations, due to a fear the economic competition they would bring. Beginning in 1808, Britain dispatched a squadron of cruisers to patrol the African coast, which grew until the 1840s when it made up one-sixth of the British navy. With Britain’s naval superiority and other trading nations reluctant to enforce their anti-slave trading laws even when they were passed, the Royal Navy remained the primary force stopping slave ships from reaching their destinations throughout the first half of the nineteenth century. Once these slaving ships were intercepted, the British Navy sent the slaves on to various settlements along the West African coast, the foremost being Freetown, Sierra Leone. 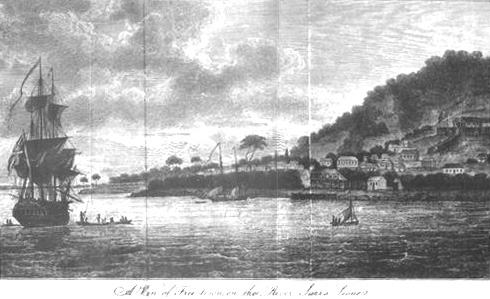 Freetown had a long history of housing ex-slaves, having been settled in the 1700s partially by ex-slaves from London, Jamaica, and Nova Scotia in Canada. From 1808 to roughly 1850, 50,000 ‘recaptives’ were brought to Freetown, Sierra Leone, and settled in the surrounding area. These recaptives shared little identification with one another, with no common language or culture. However, the Anglican missionaries from Britain worked with the population and thus provided them with the basis of a shared culture in a common language (English) and in Christianity. Bishop Samuel Crowther and James Africanus Beale Horton were two of the most prominent 19th Century Recaptives. By 1910, Recaptives and their descendants constituted the majority of the educated class in Sierra Leone; and when it gained independence from Britain in 1961, many of the senior ranks of civil servants were occupied by the descendants of Recaptives, despite their constituting only around five percent of the population. In 1993 the ‘Aku’, the ethnic group largely made up of descendants of Recaptives, continued to enjoy much higher rates of education than other ethnic groups in Sierra Leone. Sir Reginald Coupland, The British Anti-Slavery Movement, (Frank Cass & Co. Ltd., London, 1933); Adam Jones, From Slaves to Palm Kernals: A history of the Galinhas Country (West Africa) 1730-1890, (Frank Steiner Verlag GMBH, Wiesbaden, 1983); Frank J. Klingberg, The Anti-Slavery Movement in England: A study on English Humanitarianism, (Yale University Press, 1926).